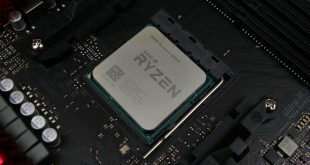 Enthusiasts have pinned hope on AMD’s eagerly-anticipated Ryzen 5 line-up as a set of processors that can offer competitive performance at an affordable, mid-range price point. The price range in question is currently dominated by Intel’s quad-core Core i5 CPUs that do not feature Hyper-Threading and only get an unlocked multiplier for the highest-end option. AMD is taking the fight to Intel’s $242 multiplier-unlocked 3.8-4.2GHz Core i5-7600K 4C4T processor with a 6C12T Ryzen 5 1600X clocked at 3.6-4.0GHz and retailing for $249. With overclocking the Core i5-7600K to 4.8GHz+ being a known simple procedure, can AMD’s Ryzen 5 1600X leverage its 50% increase in cores and three-times as many threads to compete against the current mid-range champion? The six-core, twelve-thread 1600X comes in as AMD’s Ryzen 5 flagship. 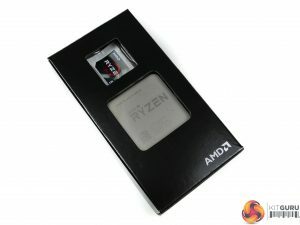 Sporting a clock speed of 3.6-4.0GHz using Precision Boost, with up to 4.1GHz under Extended Frequency Range (XFR) conditions, the six-core part is essentially three quarters of a Ryzen 7 1800X. That point holds true for several of the metrics. However, the TDP is still rated at 95W and the twin CPU Complex (CCX) design means that the 1600X retains its full slab of 16MB shared L3 cache. 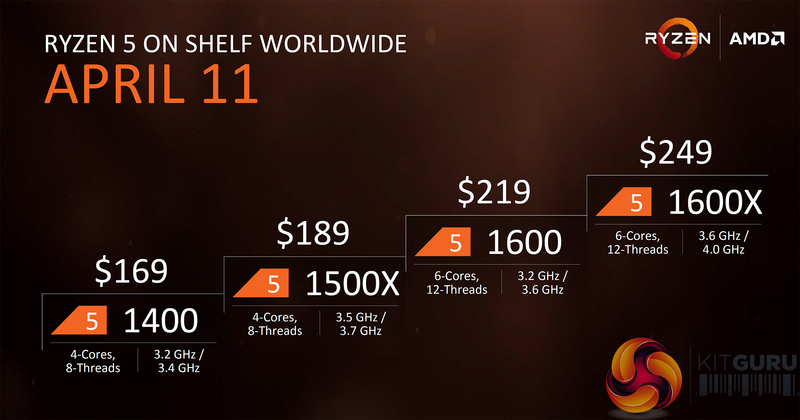 L2 cache tips the scales at the same 512KB per core for all Ryzen processors thus far, giving this six-core part a 3MB capacity. On the topic of the dual CCX design, AMD is deploying Ryzen 5 six-core parts as 3+3 layouts. This means that one CPU core per CCX is disabled before joining the pair of complexes together by AMD’s Infinity Fabric. A 3+3 design should achieve the highest level of balance and it helps to ensure part consistency; opting for 3+3 as well as 4+2 layouts would have introduced manufacturing and performance variations between supposedly identical Ryzen 5 six-core processors. Utilisation of the CCXs in a 3-core capacity may also allow AMD to put defunct Ryzen 7 silicon to effective use. 14nm FinFET manufacturing is not cheap and the less silicon put in the bin, the better. Of course, there’s also the other side of the argument that suggests AMD is manually disabling a single core on the CCXs to achieve market segmentation. If this is true, we could see a return to the good old days of core unlocking on AMD CPUs but we do not know if this will be the case (or if it’s even possible). To say that AM4 is a flexible platform would be an understatement. Like all other Ryzen processors, the Ryzen 5 1600X can be dropped into an AM4 motherboard with no less than five different chipset types. Three of those – the enthusiast X370, mainstream B350, and SFF X300 – support overclocking with Ryzen’s unlocked core multiplier. 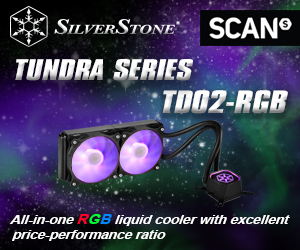 By comparison, Intel forces you onto its Z270 chipset for overclocking support (and high-speed memory, for that matter) with LGA 1151 CPUs and those boards come with a ~£100 starting price. The logical partner for Ryzen 5 is a B350 chipset motherboard. Compared to the high-end (read: expensive) enthusiast-geared X370 motherboards found partnered with Ryzen 7, B350 forces you to give up PCIe bifurcation thus blocking multi-GPU CrossFire and SLI support, as well as a small number of USB 3.0, SATA 6Gbps, and PCIe 2.0 lanes. 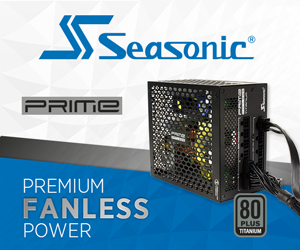 You’ll also have to accept the lower quality power delivery solution that vendors tend to create on their B350 motherboards that hover around a £100 sweet-spot. By comparison, £100 gets you an entry-level Intel Z270 motherboard that is short on frills but utilises the feature-rich 200-series chipset. B350 AM4 motherboards start at around £80. £80 for Intel gets you a non-overclockable H270 or B250 chipset offering. At $249, Ryzen 5’s flagship 1600X is pitted squarely against Intel’s fastest Core i5 – the $242 Kaby Lake 7600K. AMD offers up two more physical cores, which translates into eight additional threads thanks to Simultaneous Multi-Threading (SMT). Meanwhile, Intel puts forward a 4.2GHz maximum Turbo Boost speed and the strong likelihood of a straightforward 4.6GHz+ overclock thanks to the vendor’s refined 14nm+ process technology. Neither processor ships with a cooler, meaning that head-to-head price point comparisons are just that. Cooler Master’s £27 Hyper 212X is the logical partner. Both CPUs should also work fine with DDR4 speeds that are sensible for this price range (3200MHz and below), provided you have a stable BIOS on the accompanying motherboard. 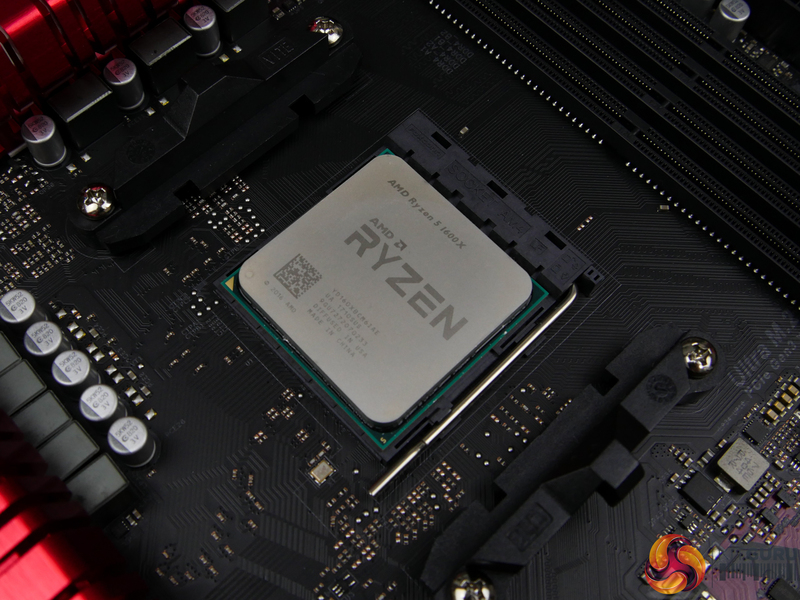 For more information regarding Ryzen and the AM4 platform, read our launch review for the Ryzen 7 1800X HERE. You can also read our Ryzen 7 1700 review HERE and the Ryzen 7 1700X review HERE.